If you go down to the woods today, and your favourite Italian trattoria comes to mind, it’s probably because you’ve just disturbed a crop of wild garlic. Also known as “Ramsons”, wild garlic is part of the Allium family, and is related to chives, onions and leeks. 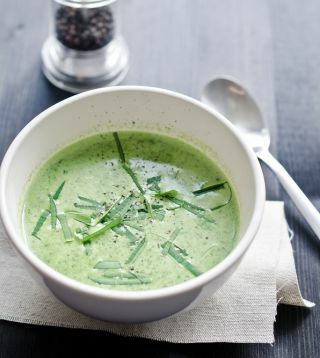 Here we team it with another wild ingredient, stinging nettles, to make a highly nutritious soup. Wash the garlic leaves and nettles, using clean gloves or tongs when handling the nettles. (Once they are cooked they lose their sting). Melt the butter in a pan and, on a low heat, cook the onion and potato for 10 minutes, until softened a little but not browned. Add the stock and bring to the boil. Cover and simmer for 15 minutes. Add wild garlic leaves (retaining a few for garnish) and nettles, return the lid and simmer gently for around 10 minutes. Allow to cool a little and then liquidise in the pan using a stick blender, or transfer to a blender and liquidise, then return to the pan. Test the flavour and then add freshly ground black pepper and sea salt as needed. Return to the heat and bring back to serving temperature, but don’t allow to boil. Serve in warmed bowls with crunchy croutons, a swirl of cream, a sprinkling of freshly chopped garlic leaves and a tale of your walk in the woods!